GeoSystems performed geotechnical investigation and construction monitoring and testing services for new fuel storage tank locations in Colonial Pipeline Company’s Atlanta Junction tank yard in Austell, Georgia. The tanks were being constructed to store ultra low sulfur diesel (ULSD) that complies to new EPA regulations mandating diesel with sulfur content not exceeding 15 ppm. The switch to ultra low sulfur fuels adds strain to an already complex system of pipelines, interfaces, and storage fields. Colonial Pipeline Company’s ULSD supply project was initiated to fast-track supply to large trucks in the southeast which must comply with EPA regulations specifying 80% ULSD consumption by June 2006 and 100% by June 2010. GeoSystems was contracted to provide the in-depth geotechnical investigation and construction monitoring and testing services for the new required storage tanks. The tanks were planned with a diameter of roughly 120 feet and height of 48 feet. Initially, GeoSystems was contracted to provide subsurface investigation services for three tank locations. Twenty soil test borings were performed to investigate areas within the tank footprints, beneath a planned control building, at a retaining wall location, and in a proposed borrow area. Later, two more tank locations were added to the project scope. Three additional soil test borings were performed to investigate conditions in these areas. Various laboratory tests were conducted on samples collected including grain-size, consolidation, standard proctor, and hydraulic conductivity testing. The tanks locations were found to be underlain by fill, alluvial and residual soils, partially weathered rock, and refusal material interpreted as bedrock. After collecting various samples GeoSystems began its analysis and report preparation. Our report included provisions for design of tank foundations, subsurface characterization, expected settlements, suitability of borrow materials for construction of spill containment dikes and retaining walls, design criteria for retaining structures, and other topics. 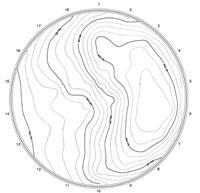 Settlement calculations were based on standard Westergaard stress distributions and a multi-layered soil profile. 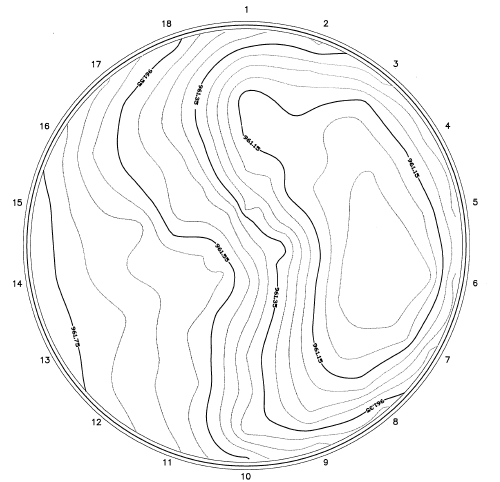 Settlements were computed utilizing specific consolidation test data, and elastic soil properties derived from correlations with standard penetration resistances. Settlements at the centers of the tanks were predicted in the range of 10 to 12 inches and 12 to 15 inches. Settlement at the edge was estimated at 7 to 10 inches. Preloading of the tanks with water was specified to induce settlements prior to loading the tanks with product. 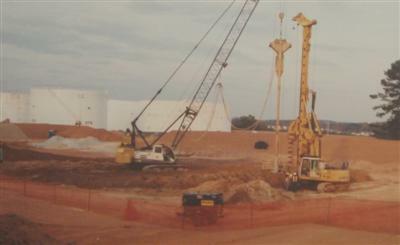 In addition to the preloading process, Colonial Pipeline Company opted to installed aggregate piers as part of the tank foundation to limit working settlements to five inches or less. In order to precisely monitor tank movements, determine the effectiveness of the aggregate piers, and approximate total settlements, GeoSystems developed a detailed monitoring plan. Four of the five investigated tank locations were selected for construction. To monitor tank settlements, GeoSystems installed fluid pressure cells beneath the foundation graded aggregate base at the center of each tank. 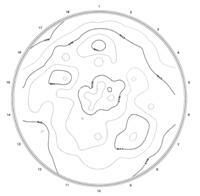 Over the course of preloading process, settlement readings were recorded at the tank centers and careful elevation readings were taken around the perimeter of each tank. 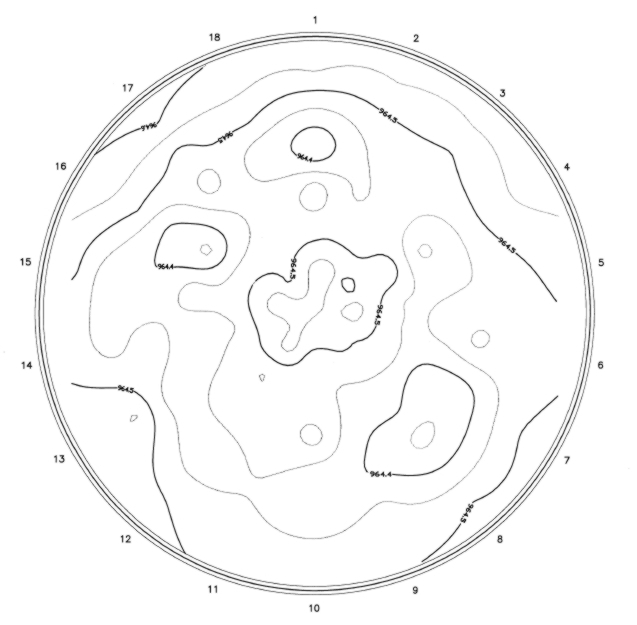 GeoSystems analyzed the collected data and estimated surface contour maps of the tank foundations. Settlements were found to be greater those estimated by the aggregate pier installer, and slightly exceeded amounts initially estimated by GeoSystems Engineering. 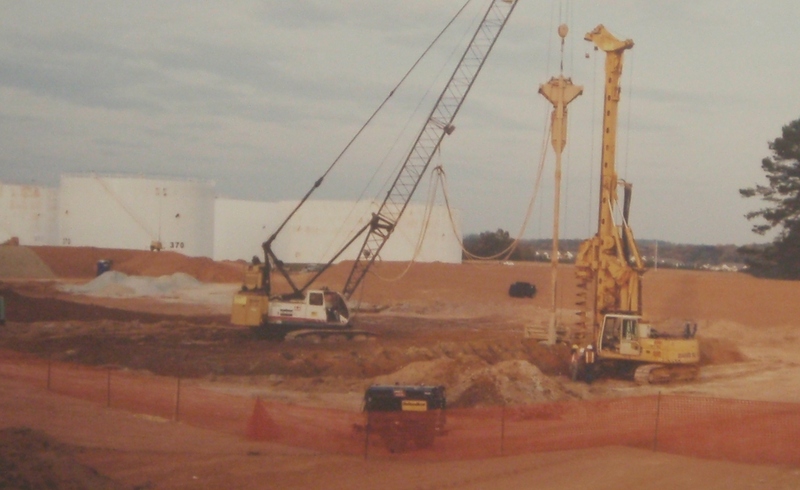 During tank construction, GeoSystems performed all soil density testing and monitoring to insure quality compaction of exposed tank foundation soils, compacted fill for spill retaining dikes, and compacted soils for plant roadways. Concrete material testing was also performed by GeoSystems. The large quantity of soils and concrete testing proved our ability to handle large scale construction testing jobs. Unlike ground storage tanks for many water authority projects, pipeline and fuel storage yards often do not have the ability to select tank sites based on overall site suitability. Rather, tank locations are limited to areas close to the existing pipeline interfaces and tank yards where security is provided and minimal additional piping is required. Subsurface conditions were found to vary over the area examined in this study, and although tank sites were selected prior to our investigation, preliminary subsurface exploration would be beneficial in selecting areas in storage yards better suited for expansion. Geotechnical investigations for ground storage tanks of fuel or chemicals are crucial to insuring the stability of the tank and safety of the stored material. For this tank project, excess settlements warranted the design and installation of aggregate piers to bolster foundation strength. After monitoring of the preload process, aggregate piers did not provide the amount of support expected, but overall settlements were close to those initially predicted by GeoSystems Engineering. GeoSystems performed geotechnical engineering and construction monitoring and testing for the Atlanta Junction expansion in a very condensed time period. Our company performed extremely well and was able to provide detail in every service provided. For more information about this and other projects please contact GeoSystems Engineering, Inc. at (678) 722-0340.